Chanel FW 2009-2010 RTW runway. 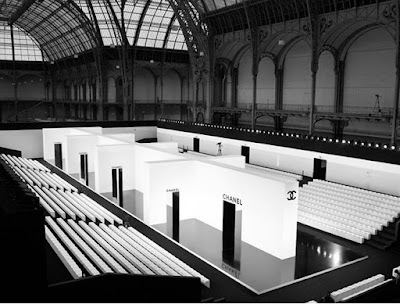 The set was a succesion of eight white spaces, breaking the typical linear move of the models down the runway. Black laquered floor and you could have look just as well been into the Chanel couture salon on rue Cambon. I posted about the white paper roses made for this Chanel runway. Well, the man behind all Chanell runway decor and designs is Stefan Lubrina. He has been working for the house for 15 years. Imagine that. He always keeps the Chanel spirit intact. And says that an explosion of bright colors or prints. would be the worst thing when designing for Chanel. Or, yes potted plants. I agree, it would be horrible to say the least bit. Brrr. Also, Lubrina talks about that magnificent flower decor as being one stage element that has to keep allowing people to dream. Becaue shows, fashion shows and quirky clothes are here to make us them about probable worlds. Just thinking that these exist somewhere on this planet gives me hope and keeps me dreaming. Or at least that's what I think it is the purpose of runway shows in general and fashion in particular. Stefan Lubrina started in theather, then moved on to designing sets for Karl Lagerfeld's photography. After that, it was window merchandising for Chloé, Lagerfeld and Chanel. He would never say to Karl “That’s impossible”. It's a point of honor to keep and make anything possible.